The simple, bent beams of Azuma’s Croce(Hugging Cross) resembles the open, outstretched arms of Christ. The empty space created by projecting the “arms” of the cross out away from the vertical and horizontal beams of the cross opens it up. The cross depicts a new reality within our human, earth dimension expressed by the space between the cross and the “arms”. His resurrected body, which is missing, suggests God’s presence, not his absence. The emptiness represents a presence and not an absence of the divine. Christ, through the cross, extends to everyone welcome and hospitality. Christ is our truest home place. The Croce emphasizes one of the most powerful of human gestures-open arms. Christ opens his arms on the cross and creates a world of new possibilities for us. The cross speaks of the hospitality and welcome of God. Christ’s open arms, opens up the boundaries of community, opens up the pathway of salvation and forgiveness. Jesus creates new kinships when he invites us to open our arms to one another and receive each other as brother and sister, mother and father. “Woman, behold your son.” We open our arms to one another when we hug, comfort, welcome, heal, forgive, and serve. The three Marys follow Christ faithfully to his cross. John and Mary remain faithful to new boundaries of community, faithful to new visions of family and responsibility. We are invited to the cross to respond in faithfulness to this new vision ourselves. 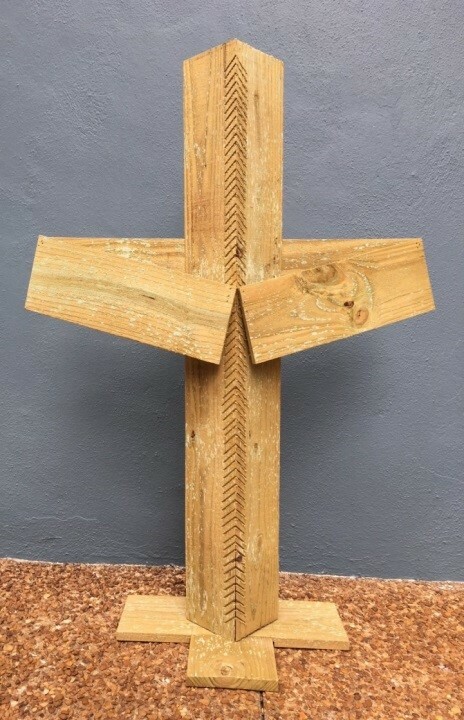 The message of the reclaimed wood in the cross is that Christ has dramatically transformed us by an act of profound grace reclaiming and repurposing us for His glory. As He offered us grace so we extend it to one another. Prayer cards can be found at the base of the cross. Write your prayer request then insert into a slot in the cross. The Prayer/Care Ministry will gather the cards and pray over them weekly.